Jefferson’s, the plumbers you know. If you live around Princeton, West Windsor, or Skillman you've seen NC Jefferson Plumbing iconic yellow trucks. They began appearing in 1947 when Norton (NC) opened the business, the month and year his son Bruce was born. Thirty years later, Bruce took over. 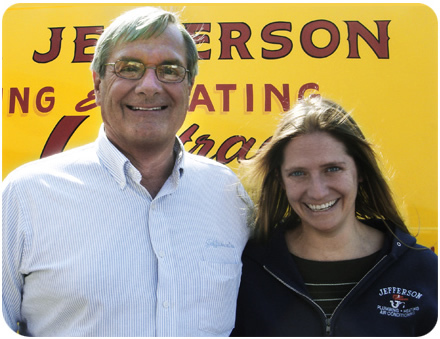 His daughter Jill, who grew up stacking pipe fittings, joined in 2004. Jill's the one to talk to about environmentally friendly bath and kitchen fixtures. She'll show you a shower system that lets you linger in hot showers and cuts your water bill. Any Jefferson bathroom remodel is done entirely by Jefferson's team. Jefferson's serves Belle Mead, Hopewell, Kingston, Lawrenceville, Pennington, Plainsboro, Princeton, Rocky Hill, Skillman, West Windsor, South Brunswick.